Southampton, PA — Leak-proof molded manifold connections for single use process systems are immediately available from AdvantaPure. Due to the company's high-grade materials, superior workmanship, and attention to detail, it is able to confidently offer a guarantee that the connections will not leak. The manifolds are used in pharmaceutical and biopharmaceutical manufacturing for batch-filling and sampling applications. 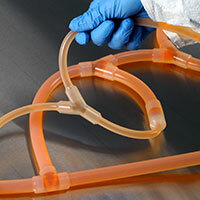 Guaranteed leak proof molded manifold connections are custom made from platinum-cured, USP Class VI silicone tubing and molded fittings in Class7 (Class 10,000) ISO-certified clean rooms under the highest quality controls. Connection styles include tee, wye, cross and reducer in sizes ranging from 0.188" through 1" I.D. Other components such as filters, bags, bottles, sensors, BioClosure® stoppers and container closures may be assembled onto the manifold for a complete, ready-to-use system. Comprehensive validation and extractables test portfolios are available, as well as validated sterility assurance of 10-6 per ISO 11137 method VDmax. For more information on AdvantaPure’s leak-proof molded manifold connections and the guarantee, contact the AdvantaPure team at 145 James Way, Southampton, PA 18966; phone 888-755-4370 or 215-526-2151; fax 888-258-4293 or 215-526-2167; e-mail: sales@advantapure.com; website: http://www.advantapure.com/single-use-molded-manifolds.htm; guarantee: http://www.advantapure.com/guarantee-leak-proof.htm. This product will also be displayed at Interphex and Techno Pharm.